ANTI stands for A New Type of Interference, and this is precisely their vision: to always deliver interference in their work, in the way they are with their clients and how they run the company. In 2008, two Norwegians, Kenneth Pedersen and Kjetil Wold, established the popular multi-disciplinary agency, and to this day, they are firmly convinced that everything can be challenged and done differently – in a better way. Not long after starting up, the young company managed to retain its first international job for Pepsi Co. in the US, which at the same time resulted in more jobs for Norwegian clients. With the big demand, ANTI understood that they had to grow, but instead of focusing on developing their Oslo branch, they opened a new office in Bergen along with Endre Berentzen and Robert Dalen. “Because we always wanted to stay small, we had a fear of having too many employees. Our initial aim was to be like a small punk band, and everyone knows that punk bands never have more than five members,” Pedersen recalls. But, eventually, the employees needed more help. There were too many jobs for them to handle on their own, and suddenly ANTI became a big band of 13 people in Oslo and five in Bergen. 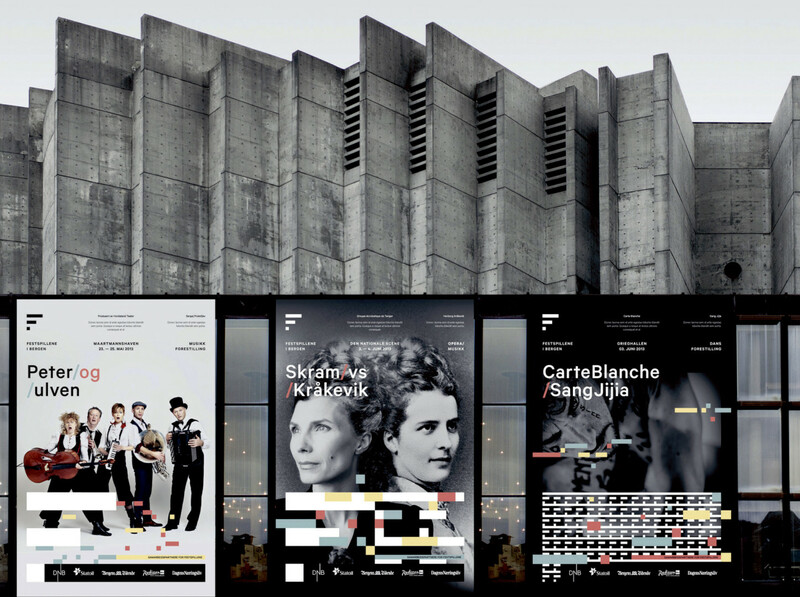 ANTI won Grand Prix for their identity created for Festspillene in Bergen at Cannes. An important part of ANTI’s culture is built on exploring new business and product ideas, which often results in creating new, exciting facets of the company. By doing this, they can learn a lot about the needs and challenges that face their clients. “Our first ANTI project was making our own jeans brand called ANTI Denim. Our first jeans model was named ANTI SWEDEN. We had our own fashion week, which we named Fashion Week in HELL. Hell is a village close to Trondheim in Norway, and suddenly we had distribution and fans all over the world. We learnt a lot from this process, about production, distribution and quality control – to name a just a few things,” says Pedersen. After ANTI Denim, the company started its own magazine, Ingrid Opstaditing about Norwegian creativity. After 13 issues, it was distributed in more than 20 countries, and the editor was voted as one of the top ten editors in the world. Today, the growing company is working on two ANTI projects: FARA Cycling, which retails high-end racing bikes for tarmac and gravel, as well as a music initiative called nstrumental. ANTI nstrumental is a film series that showcases the most exciting, current music artists. Each episode is comprised of two key elements: a documentary, and a live concert. In the autumn of 2018, ANTI counted its ten-year anniversary, something that was celebrated both with a trip to Barcelona for all the employees and by developing a new brand identity. “Our identity is an ANTI identity, which rather than exist on top of or as a signature below content, is found in the hidden or unsaid of content itself. It does not try to steal the attention away from the content itself, but rather, is placed in the subconscious, through the lack of initials, as a quality signature and important part of what we do, our products and our content,” Pedersen explains. ANTI began with a strong focus on design, and over the years it has grown into a multi-disciplinary agency, offering a range of services in design, strategy, advertising, communication, content services, TV productions, digital services, PR and influencers. Today, ANTI has offices in Oslo, Bergen, Trondheim and Hamar, as well as a small team in the USA. Having multiple offices makes it possible to work with both local and international clients, while giving access to the widest talent pool possible. Asked if the agency has a quintessential design expression, the CEO does not believe they do. “In the early years, we were probably quite dark. Today, we are not guided by a style, but instead we begin by developing the right strategic starting point for achieving the goals of our clients. We are very concerned with distilling their insight so that it results in the right effect. In addition, we always want to challenge and deliver solutions that will stand out from the crowd,” Pedersen further explains. ANTI works with clients from all over the world, so they certainly have international ambitions. That said, their main emphasis is on Norway. “A common thread for all of our clients is that that they come to us to be challenged and really look at their problem again. We have had the opportunity to work with a wide variety of brands, such as the New York Times, Nike, Hyper Loop, Coop, Posten / Bring, Telenor Global, Kari Traa, Kunstnernes Hus, Hennig Olsen Is, and many, many more. We also work with start-up companies and small projects that need to push a specific expression or style to challenge their target audience,” says Pedersen.